Granted, most visitors come to the Alabama Gulf Coast to spend as much time as possible soaking up the sun and relaxing on the beach. With the sugar-white sand and the beautiful Gulf waters, what else can you ask for? As we see much too often, visitors absorb as much sun as they can on their first couple days in town. But on the third, fourth and fifth day, the sun has taken its toll and the kids are water logged. In order to keep it interesting, here are a few ways to keep the kids entertained off the beach. advantage of a dolphin cruise. Go sightseeing and experience some educational and entertaining fun on the back bays of Orange Beach. Sail Wild Hearts, located in Orange Beach, offers a journey aboard a 53-foot, open-ocean catamaran for daily dolphin and sunset cruises. Skull Harbor offers a unique Pirate Ship Cruise on board the American Star which features a celebration of the gold recovery with a water gun battle, a hunt for the lost treasure and face paintings. Spend two hours discovering the lost gold of Pirate’s Cove and listen to true stories of secret treasure maps and the journey of Captain Billie Bowlegs. After seeing the area through the eyes of a pirate, try seeing it through the eyes of a cyclist. Beach Bike Rentals has daily and weekly bicycle rentals with three bicycle choices to choose from. Mother Nature has blessed the Alabama Gulf Coast with natural beauty so avoid the highways and cycle through The Backcountry Trail, Gulf State Park or the bike path on Fort Morgan Road. 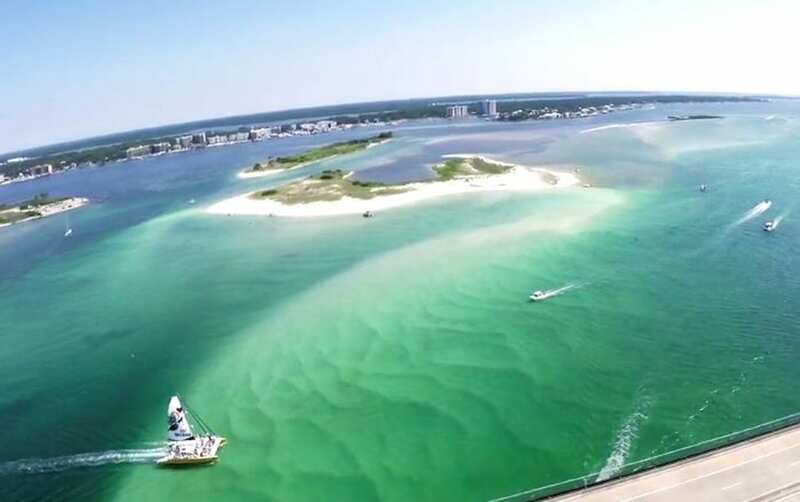 If you are looking to sight see and relax at the same time, look into the Guided Eco-Tours provided by the City of Orange Beach. For only $15 per person, a friendly and knowledgeable tour guide will show you around the natural habitats on a covered electric cart. Reservations can be made via email atlellis@cityoforangebeach.com. If you are a thrill seeker looking to get a bird’s eye view of the Gulf Coast, don’t miss out on a helicopter tour with Fly Oasis. Make a memory of a lifetime and fly the big blue sky in a nimble Robinson R44 four-seater helicopter. With two convenient heliport locations at Caribe the Resort and at The Wharf, tourists and locals can take advantage of this great amenity. Tours fly from 10 a.m. to dusk and Oasis is also licensed to charter flights from the Alabama Coast to Wind Creek Casino or Biloxi. If you have experienced any of our recommendations, we would love to hear your feedback or additional unique activity recommendations. And remember, just because you are not on the beach, doesn’t mean you don’t have to wear sunscreen.